The goal: criminalize abortion, make it impossible for a physician in the U.S. to perform an abortion or for a woman in the U.S. to obtain a safe, legal abortion. The progress: excellent. The methods: distortion, sensationalism and more than a few outright lies. The concern for women: zero. But it’s working. Obviously it’s going to get a lot of conservative Republicans elected. Two weeks ago the Georgia Senate passed SB 529 with overwhelming support. On Tuesday, April 13, 2010, SB 529 had a hearing in the House Judiciary Committee, but no vote was taken. SB 529 was drafted by some of the leading pro-life attorney’s in the nation and was reviewed positively by the American Center for Law and Justice, Liberty Counsel, the Thomas Moore Law Center, Americans United for Life, and Focus on the Family. 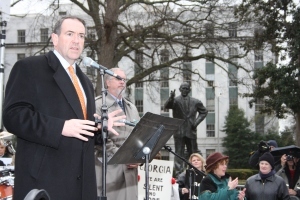 Here are just a few interesting factoids: Mike Huckabee is the former governor of Arkansas, currently a regular on Fox News, formerly a candidate for the Republican presidential nomination. Presumably his “constituents” are those who will now support his next presidential — or whatever — bid because of this brave stand against “forced abortion.” Focus on the Family is a Christian organization that is not averse to messing around in political campaigns. The un-subtle message of that “as a means of race discrimination” is the bizarre hook with which abortion foes are seeking to manipulate African Americans, by equating abortion with Black genocide. It is simply not so. Women do not need pious white guys protecting them from being marched in droves into abortion clinics. African American women do not need anybody telling them what they may or may not do with their bodies. What we need is the right to life, our lives. The right to choose. The right to control our own bodies. Once the abortion foes win this battle — which gets scarier by the day — those basic human rights will be taken away from American women. Because women get pregnant. Sometimes that pregnancy is a mistake, a threat, a danger. When abortion becomes illegal, women will have no option but the back alley abortionist. Decreasing numbers of us know what that was like, but I can tell you. Before Roe v Wade, legions of women, for countless valid reasons, needed to terminate a pregnancy. A few found doctors willing to risk their license in order to give a woman a safe choice. But uncounted thousands of us wound up in the filthy, unsafe, demeaning hands of back alley abortionists. Uncounted thousands died. Those who died were white, Black and all shades in between. Would Mike Huckabee like to see his daughter go through that tragic indignity? That’s where we are headed. « Ex-Justice O'Connor on AZ immigration law: perhaps "a little too far"